Looking for the hottest outdoor living design trends this year? In 2018, we are trending towards a natural, yet colourful look with earthy and neutral colour schemes and materials. Truly liveable outdoor spaces will become ‘the norm’ in new homes. We will rejoice in contrasts and natural finishes and herald in the next ‘look’ which some are calling the ‘tribal trend’ and some are calling the ‘Australiana trend’. Whatever you want to call it, if you are renovating your outdoor living space this year and trends matter to you, these ten tips will keep you up to date. Think unpainted timber and stone. Think brown and beige shades, terracotta, burned orange, russets and sienna, muddy blues and greens. We will see a move away from pastels and a return to bright bold colours. For those who really like the calming neutral effects of 2017’s colour trend, you can keep it, but modernise it with deep blues and greens mixed with your white, grey and beige tones. Another popular trend is the use of different materials and textures but within the same colour family. Decor-wise, 2018 is going tribal, so get out your Moroccan bowls and terracotta planters. 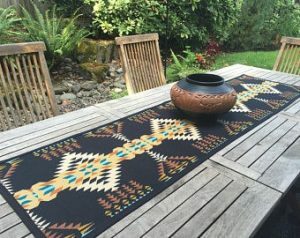 Look for tribal décor, patterns and accessories. The addition of new external structures around the home will be applied more thoughtfully, designed to blend with the house, and not just added as afterthoughts or obvious add-ons to the property. Homeowners will want their garages, carports, patios, fences, sheds, etc. to blend naturally as well as fashionably with their existing house and garden landscape, and also the streetscape, creating a more integrated look. In 2018, outdoor kitchens with cooking facilities, sinks and fridges will continue to be popular, as well as outdoor showers and lounge areas complete with daybeds and TVs on the wall. This is actually a smart way to extend the living area of a small home and will add value as well as space for growing families. The trend towards using composite timber decking, like NewTechWood, will continue to grow in popularity. Not only is it eco-friendly, NewTechWood has none of the issues associated with pure timber – no splinters, no nails, and totally maintenance free – you never have to sand or re-seal it. Termites hate it and it’s resistant to mould, UV, fading, warping, and splitting, and it comes with a 25-year warranty. Best of all, NewTechWood looks natural, like real timber, right down to the tiny little timber-like ‘fibres’ that are a patented part of the design. Dark timbers are in for 2018, so check out the Walnut range. Not a new idea but a continuing trend is installing ceiling fans in your outdoor living areas. Not all houses enjoy afternoon sea breezes due to their location, but a ceiling fan under the pergola or patio solves that problem. In winter, for warmth, you will be using fire pits, or go one step further and install a proper fireplace – all trends we will see on the increase in 2018, enabling us to truly live outdoors and make full use of our amazing climate. ‘Strip lighting’ or ‘deck lights’ as you see beneath steps, will become more popular and used in more creative ways, such as on bench tops and to lighten built-in seating areas in dark corners of patios or any area you want to showcase or create mood lighting. In Australia, with our hot climate and water conservation, the continuing trend towards succulents makes good sense. You can still enjoy diversity and colour in your garden, as many succulent varieties flower at different times of the year and need very little water or maintenance. With building blocks becoming smaller and many older blocks being subdivided, land space is minimal, and those who live in apartments or homes with small yards will continue to enjoy their gardens ‘vertically’ rather than horizontally. 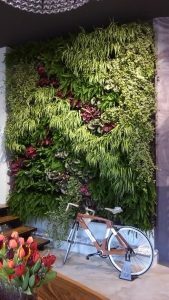 Vertical gardens, like the Atlantis Vertical Garden kits, with or without built-in irrigation, are the perfect solution to hide ugly walls or to grow flowers or herbs in tiny spaces where a traditional garden is not possible. Unless you have a very good reason for camouflaging your timber with thick coats of paint, either a clear varnish or a light stain will be favoured to let the natural beauty shine through. While internally, wallpaper is making a comeback in 2018, externally, with tribal themes fashionable, consider bamboo, reed or brushwood screening and leafy plants for privacy screens or to hide ugly fencing or walls. If you haven’t heard of Wabi Sabi before, you may well do in 2018. It is the Japanese Zen philosophy of accepting the transient nature of things and their imperfections or finding the beauty within the imperfect. Think of handmade bowls with cracks, chips or glazing errors, irregular shaped items and pieces that are pre-loved and showing their age. If it’s old, cracked, weathered, wrinkled or oxidized, so much the better. Forget the large department stores for this one and start visiting your local flea markets. On the other hand, trends come and go, and keeping up can be hard on the wallet. Maybe the best trend is the one that expresses your individuality and suits your lifestyle and taste. After all, you have to live with it! Want to learn more about the hottest outdoor living design trends in 2018 or maintenance-free, eco-friendly timber products? Talk to the team at NewTechWood today.